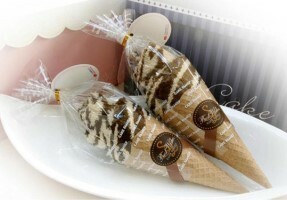 The Rocky Road Chocolate Ice Cream Cone has a jacquard pattern and it measures 13" X 13" and the imprint area is 1.3" wide X 1" high. Minimum imprintable order is 100. 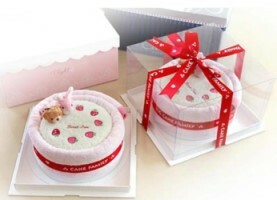 Picture on the left is the Jacquard Cranberry Cake towel that measures 11.8 inch X 10.6". and provides an imprint area of 1.3" wide X 1" high. Minimum order is 100. 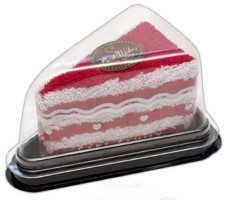 The middle picture is the 8" Animal Strawberry Cake towel that provides an imprint area of 16" wide X 1.75" on the ribbon or in an area of 1.3" wide X 1" high on the oval plate. 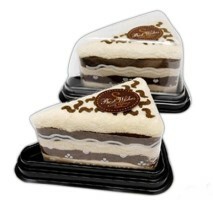 Minimum order on the Animal Strawberry Cake is 50 and it. contains three 30" X 13" towels and 2 cell phone charms. On the right is the Cherry Cake Towel that measures 11.8" X 10.6" and the custom imprint area is 1.3" wide X 1" high. Minimum imprintable quantity is 100. 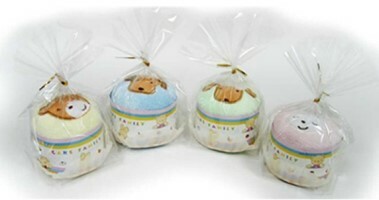 The Baby Animal Cupkae towel has embroiderd fruits decor on the top and the towel measures 12.4 X 13" with a custom imprint area of 11" wide X 1.75" high. Minimum order is 100.. 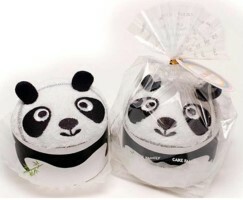 The Panda Cupcake towel has an embroidered panda face on the towel. 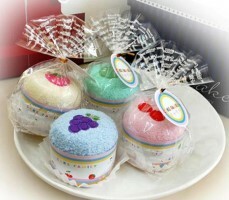 The towel size is 14.2" X 13" and provides an imprint are of 1.5" wide X .25 high.. On the right is the Fruit cupcake towel that measures 12.4" X 13 and the custom imprint area is 11" wide X 1.75" high. Minimum custom imprintable order on both of these is 100. 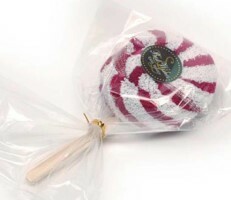 The Cranberry Rainbow Lollipop towel measures 11.8" X 10.8" and provides an imprint area of 1.3" wide X 1" high. Minimum custom imprintable order is 100.